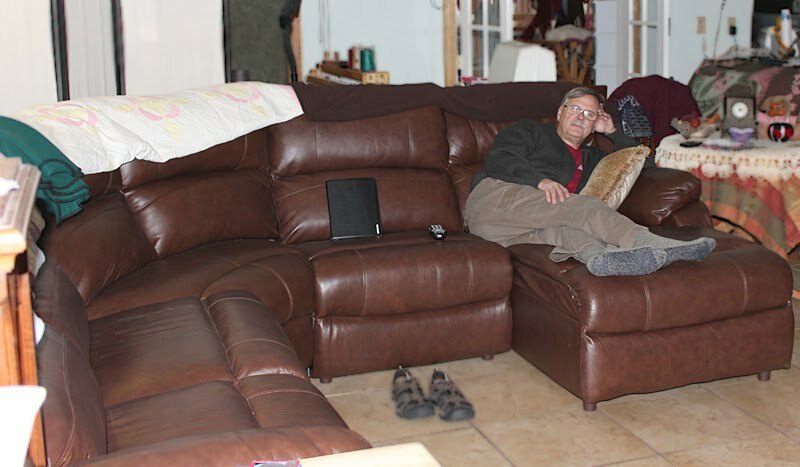 Hubby has wanted a leather couch for as long as we've been married. I've always been against it - with cats and kids, and now grandkids, it seemed like a recipe for disaster. But we found a great deal when we decided to replace our old sofa, and the salesman reinforced hubby's pitch that real leather would hold up better than fabric. Soooooooooo - as of about noon yesterday, hubby is a very happy couch potato. Sure hope they're right about it being kid/cat/grand resistant. Leather is great for kids, because they spill on it, and you just wipe it off, no staining to the fabric, especially on a dark leather. But I won't tell you what happens when you leave a labrador retriever and a husky mix with a leather couch all day, it may make you sick. kids/gradkids you are golden, but cats I can't help you. We have no fabric upholestry at our house - only wipable surfaces (except one area rug). Once in a while, the cats would try to mark their territory on our cloth couch and loveseat. We bought leather when we moved to CA. Oddly enough, neither of our cats have tried to claw our leather seats. While I agree that leather cleans easier and lasts longer than cloth, I'm not a fan of it. It's either too hot or too cold, so my seat is covered with sheet. Yes, I know I'm weird.